Janelle In Real Life: 30 weeks! 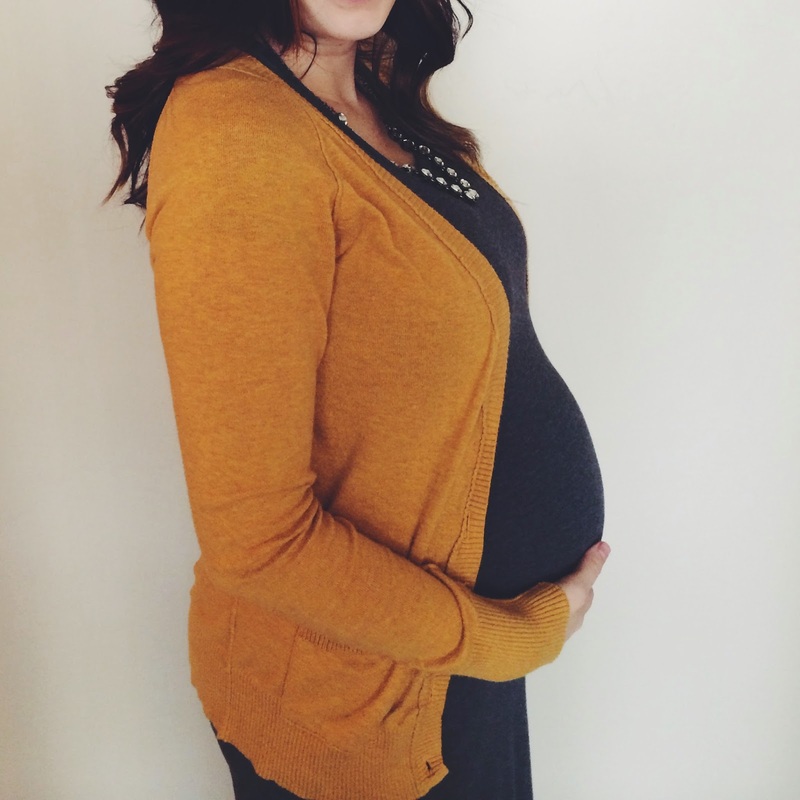 Maternity clothes: Still a mixture of my regular wardrobe and maternity clothes. I'm trying to refrain from purchasing anything but necessities as far as maternity clothes go from this point on since I'm in the home stretch! Stretch marks: I have those. I don't think I have anything new from this pregnancy though. Miss anything: having my body to myself haha. Things are starting to get real tight in there. Movement: Definitely! He kicks his big brother in the back whenever we're reading books, and his kicks are now visible from the outside. Husband can feel and see kicks too! Food craving: all the sugar. And chick-fil-a. Anything make you queasy or sick: I've had some nausea recently but I don't think there was really a trigger. Have you started to show yet: Yep, that belly is gettin' big. Happy or moody most of the time: A little moody, but mostly because of other stressors. My husband is a saint for putting up with me right now. Looking forward to: being all moved into our new place and refocusing on getting ready for baby. You guys. It's unbelievable how stressed out I am right now. I feel like I should be getting a nursery put together, and making sure things are all ready for baby around here but that is honestly the last thing on my mind right now. We're being kicked out of our condo last minute and I'm losing it over that a little bit. Luckily we're moving like... 20 yards away but still. Soooo much work. I have yet to pack a single thing and there's tons of cleaning that needs to be done. Also, my husband sprained his ankle (or something) while playing basketball the other day badly enough that he can't walk on it. I really feel bad for him and have been trying to be his nurse so that he doesn't have to get up unnecessarily. I also feel a little bad for myself because I'm on my own as far as any moving prep right now, and I'm on solo dinner/toddler duty. Nothing is really getting done. It's definitely making me appreciate how much he does around here normally though! I'm over here wondering why our trash is overflowing, because usually it's magically empty for me every morning! What a wonderful man. We're really praying that it's just a sprain and not broken because that could make moving in less than 2 weeks really awful. Steven and I could sit on our thrones and command our friends and neighbors to do our moving for us, since I can't lift anything and he can't walk. We'd be quite the pair. I'm also out about $50 worth of online purchases, which is a total bummer. I've been on the phone with the post office & have left notes for my mail carrier and my packages are gone. Boooo! And from what the lady at the post office said, someone probably stole them which is a mean and awful thing to do. Also, I can't really get reimbursed for that. $50 may not sound like a ton, but we are having to do some serious penny pinching around here lately with a couple big purchases we have coming up so $50 is kind of a lot to me! Our plans for visiting my parents for Thanksgiving are also on hold as we wait to find out the extent of Steven's injuries. I will just die if I don't get to go home. I'm also fairly certain that me driving the entire 12-14 hours in possibly inclement weather is a bad idea as well. We'll see how that goes! It's just really hard to look past everything that's going on and think about the excitement of new baby's arrival! I want to go buy all the baby things we still need, and get his room ready, and haggle with my insurance over breast pumps, and get myself a cozy robe for delivery, and do all the registration with our hospital, and just enjoy this last bit of pregnancy... it's just not happening right now. Hopefully the next time I do a pregnancy update I'll be singing a different tune! One with happiness, and things accomplished, and yay for all the new baby things! Here's hoping. I'm so sorry that you have to go through all of this! I hate moving. As for the stolen packages, have you tried contacting the places you purchased the stuff from? I've had this happen once or twice and let them know and they sent another package of what I ordered right away. Good luck with everything! Girl you look beautiful! And I'm so sorry, moving is stressful enough, I can't imagine it being 30 weeks pregnant too! I just moved, like 5 miles away from my old place, and it was a very difficult, stressful time. Aside from packing, there's mail, utilities, cable, Internet and a billion other things to think about! I hope it all goes as smoothly as possible for you!